​SQ793 is a wolf in sheep's clothing! "Right now Oklahomans benefit from a very high standard of eye care and a very competitive optical market. The only entity to benefit if this SQ passes is Walmart, to the competitive disadvantage of all eye care offices, some of which will not be able to compete, and all optical retailers." What is State Question 793? It is a state constitutional amendment that would allow an out-of-state corporation to change our laws for their own profit. Optometrists perform surgeries, diagnose and manage chronic eye diseases, and detect potentially life-threatening diseases. Important medical procedures should take place at a medical clinic, not Walmart. Your doctors decisions should be based on your health not on the revenue for a corporation. 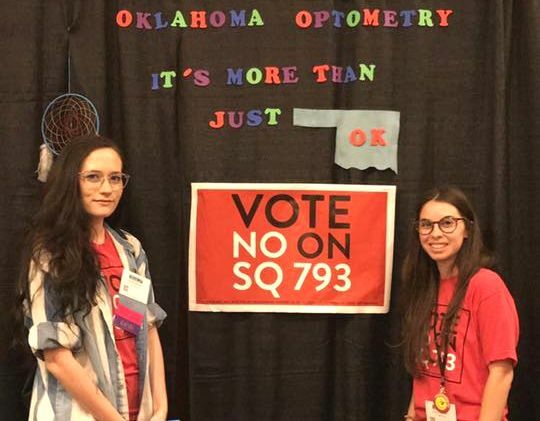 ​If this law passes Oklahoma will be the only state with eye care and corporate profits in the state constitution. Constitutions were meant for human and civil rights......not corporate profits. Oklahoma's Optometrist and Ophthalmologist are the top in the nation. Our standards are high and we care deeply for our patients. If this law passes, Walmart will degrade those standards.